Sony continues its decent run of hard-disk/DVD combi recorders with the RDR-HXD995. It is one of the most feature-packed recorders on the market, sharing many of its specifications (and hardware) with Pioneer's admirable range. The most notable difference is that the Sony-badged recorders cost less. The deck is bulky compared to most combi recorders, but that reflects the amount of technology inside its sturdy casing. The uniform black front houses a smattering of buttons, but the fold-down flap reveals more interesting assets including USB for transferring digital photos and MP3 files to the 250GB hard disk; AV inputs such as i.Link for camcorders and, less conventionally, a conditional access module (CAM) slot for Pay TV channels via Freeview. This means that you can view or record Top Up TV or Setanta Sports broadcasts as well as the regular Freeview channels from its digital tuner. The machine upscales video through its HDMI up to 1080p resolution. If you use its GuidePlus onscreen programme listings for timer recordings, it automatically changes channels on external gear such as Sky and cable receivers using the supplied infrared extender. If you only use Freeview, the alternative eight-day digital guide adds key features such as automatic Series Recording. You can play or record onto all standard DVD formats, except DVDRAM, which can be played, but not recorded. The hard disk holds between 36hr in the top quality mode to 710hr in the lowest. In between are seven recording presets, while 32 manual modes enable you to fine tune the quality more flexibly for specific DVD durations. DiVX files can be played from data CDs and DVDs, but not via the USB port. Given that this recorder does so much, it's a relief that the remote control and menus are straightforward, aided by prompts in most sections. Novices will, in time, find that what seemed complex at first is merely because it's a highly versatile recorder that lets you do things that most others fail on. For example, either of the electronic programme guides can be used while recording – a function often locked out in other machines at this time. You can also check or change timer events easily, including Series Recording options, recording modes and the EPG Link setting, which ties start and stop times to the actual broadcasts, even late-running ones. There is a single digital tuner along with an analogue one, but as with all DVD combi recorders so far, you can only record one channel at a time. The EPG finds any alternative showings of a programme, however, to help overcome recording clashes. All hard-disk recorders like this enable you to watch from DVD or hard drive while recording something else. 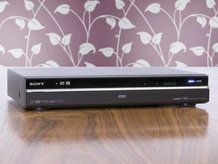 However the Sony (and Pioneer) range is able to edit existing hard disk programmes or copy at high speed to blank DVDs while making new recordings on the hard drive. Another excellent time saver is intelligent chaptering, which puts markers at major scene changes to make navigation and editing simpler. Advert breaks are flagged with remarkable accuracy. Meanwhile the Disc Backup makes fast copies of previously recorded DVDs (not commercial releases). The hard disk can house JPEGs and MP3s, too, and you can use both to create slideshows, burn them to DVD or print photos using PictBridge compatible printers. Recordings in higher quality modes are as good as the original broadcasts. The performance is boosted somewhat by upscaling, so it's not just DVD playback that benefits. There is an exclusive hard disk XP+ mode that records in a better-than-DVD bitrate of 15Mbps – ideal for DV camcorder transfers. From normal XP (for 1hr on single layer DVD) to LSP (2.5hr), pictures remain clear and well detailed. Traces of edge break-up appear with ESP (3hr) and blockiness on fast movement is more obvious from the LP (4hr) point. Beyond that you are better off using dual layered DVD-R or DVD+R(DL) to get up to about 5hr on disc at ESP mode rather than stepping down to the extended modes of EP, SLP and SEP, which fare badly due to the heavy compression they deploy. DVD playback looks pristine, though upscaling isn't quite as sharp as the Panasonic DMR-EX88, which copes better with the sharp CGI of Beowulf or the stylish photography in The Assassination of Jesse James. The RDR-HXD995 is also an enjoyable audio hub. CDs can be ripped to the hard disk at high speed in their native LPCM format, though the model lacks the useful Gracenote database for automatic track naming. You can play MP3 files from USB memory sticks and transfer them to hard disk only. Digital audio output is via the electrical digital socket and/or HDMI port. You can also output bitstream audio over electrical digital for non-HDMI equipped amplifiers without later causing problems with TV HDMI sound settings; lesser products cannot manage this. There are recorders for about the same price as the RDR-HXD995 that contain a larger hard disk, so if capacity is your main concern, the Sony doesn't fare quite so well. However, the impressive AV quality, generous connectivity and huge line-up of adaptable features make it an outstanding product overall.